she only needs 322 to command a voting majority in the Commons. BUT, of course she will need help. She has the 10 Democratic Unionists from Ulster to bail her out. A net loss of 12 seats in a house of 650 members is not as catastrophic as the BBC and others made it out. Globe and Mail is calling it a “disastrous political gamble.” Someone’s been drinking the hyperbole kool-aid. But it is a significant disappointment when you yourself said you needed a bigger mandate. May’s loss is due in part to her stampeding seniors fearing the loss of social benefits, and then she backtracked mid-campaign. May flinched. She’s no Maggie Thatcher. With UKIP and the Scots in retreat, Britain is now back to a virtual two-and-a-half party system. More on that below. Media are hailing this as a victory (?) for Labour? The best they could do is trail the Conservatives by over 50 seats? That’s a victory? But this will incline the party to keep Corbyn. The knives will be out for May. This will be a test of character. commentary by Anna Soubry, Conservative. As far as Brexit is concerned, this changes nothing. Scottish Nationalism now reminiscent of Québec’s Péquistes. One would have thought that in the shadow of two terrorist incidents, people would have rallied around the incumbent She really blew the campaign. And from what I can make of the coverage, she has surrounded herself with a very small team of advisors and shut out some of her cabinet colleagues so some will be willing to get rid of her after this result. 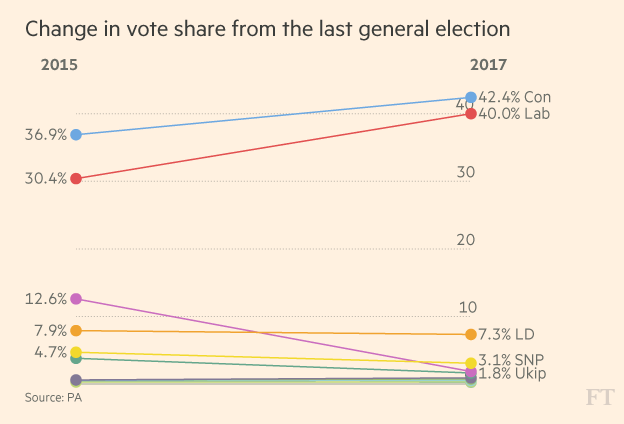 How did the Conservative vote increase over 2015…but the party gained less seats? The collapse of UKIP explains much of this. And why the hand-wringing? Many of the established democracies are ruled by minorities and coalitions, thanks to proportional systems. Accommodation and power sharing isn’t the end of the world.